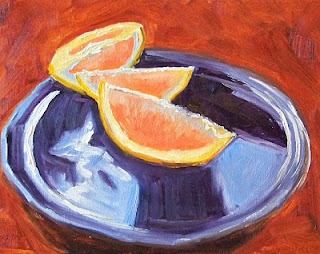 Today's painting is one of a series of citrus fruit paintings that began with yesterday's little lemon painting. 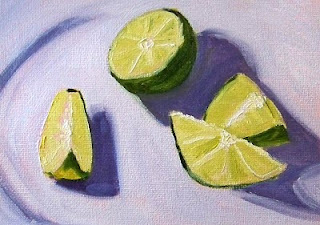 In this one I've moved onto the lime front with a gathering of little green wedges. I focused on the shadows and the contrast between dark and light. The way the shadows produce abstract shapes made it a fun painting to create. 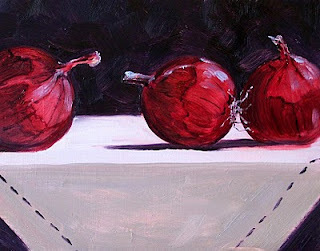 Visit my Etsy Shop, Small Impressions, to see additional small still life oil paintings. 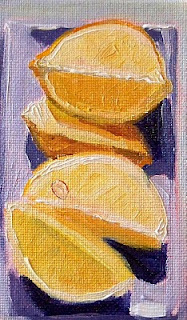 The fresh smell of lemon, the cut of a yellow citrus fruit--these are the ideas that followed me as I painted this 3x5 inch oil painting. Color and design were my focus as I worked on this especially small little canvas. There are people who work much smaller routinely, but this is about as small as I can comfortably go. I am happy with the results, but it will proably be a while before working this small again. Recharging the mental batteries will be necessary first. 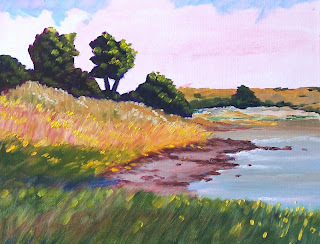 Today's painting is one I created quite a while ago on a visit to the Pacific Coast of Washington State. I always take my paints along hoping for a few extra moments to dab the brush around. The trouble is, with the drying time of oil paint, my work seldom travels home with me, but finds a comfortable place on the book shelf and waits for my return. This past weekend, after another jaunt to the coast, this little painting finally made its way home. It is dry and waiting for a new owner. 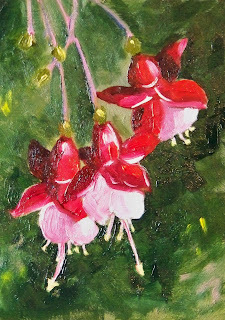 It is 5x7 inches and painted on a canvas panel and can be purchased for $35.00 plus $6.50 for shipping to US addresses. A click on the shopping cart at this link and the painting can be yours. I include tracking and insurance in my shipping price. 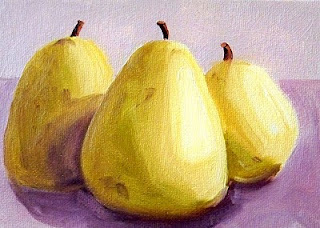 Working on a recent still life painting of pears and glass prompted me to paint this little 5x7 inch oil painting. It was created on a gessoed hardboard panel and makes a wonderful companion for my previous painting. 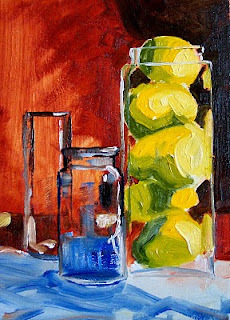 Small and traditional, I enjoyed the challenge of painting glass vessels and fruit in both paintings. 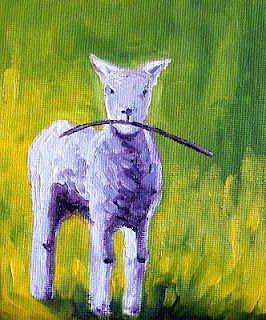 This little fellow is the third in my recent series of sheep paintings. He is full of romp and trouble, running, leaping, jumping, and having a good time. With a stick in his mouth, he's headed for some kind of mischief. The expression on his face tells me he has no regard for rules. 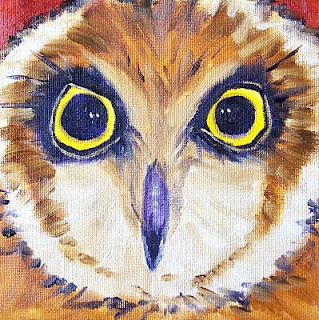 The painting is a small 4x5 inches on a canvas panel--just right for him. If I can keep him from destroying the landscape, he'll eventually end up for sale in the Small Impressions Gallery with some of my other small paintings that can be purchased online with Paypal and a couple of mouse clicks. 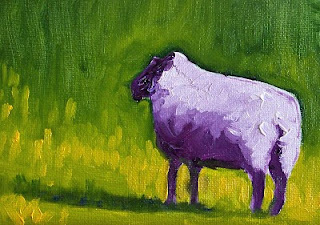 This is the second in my current series of sheep in a sunny field. I can't decide if this fellow wants me to follow him or not. The backward glance conveys some curiosity, but about what I am not certain. 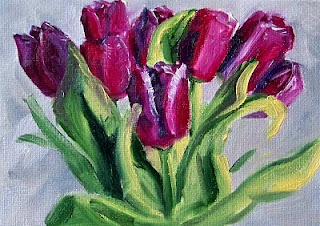 This painting is 5x7 inches on a canvas panel and was created with the same limited palette as yesterday's painting--Sap Green, Cadmium Yellow, Alizarin Crimson, Ultramarine Blue, and Titanium White. When the paintings in this series dry, they will join some of my other animal paintings at Small Impressions Gallery where they can be purchased online. 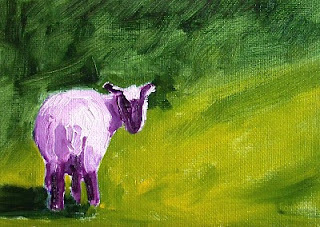 Painting sheep in fields of green is a creative direction I take when feeling a need to relax. After a busy week, it is nice to imagine myself in a summer field with these peaceful animals roaming about, grazing, and taking it easy. This painting is a 5x7 inch oil painting of a really large animal looking over the landscape. I can only imagine what he is thinking. Perhaps it just feels good to have the sun on his back and plenty of grass to eat. Life is good! The reference image for this painting is from the Wetcanvas Image Library. I've looked at it numerous times times, loving the stack of pears in the tall glass container. The photograph was over exposed and I wasn't sure I could pull off a believable redition, but this morning I decided to give it a try. I'm quite satisfied with the results. The work is loose and the colors seem to work well. The painting is 5x7 inches and I'm wishing now that I had put it on a larger support. There are some 11x 14 inch canvases in my studio that might benefit from a little paint. Perhaps doing this again will be future a challenge. Today's painting is one of my favorites. I painted it a few months ago and have contemplated whether a larger version should be my next step or not. After having enjoyed it for several months, I've finally decided to let it go and quit pondering its future. This 8x10 inch oil painting on a gessoed hardboard panel is now for sale at Small Impressions Gallery for $125.00 plus $12.00 for shippng to US addresses. You may purchase it from the Gallery by clicking here. 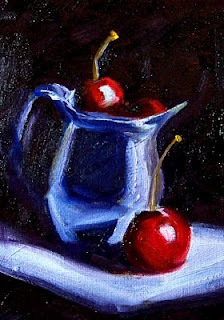 This little 6x6 inch oil painting was absolutely fun, fun, fun to paint! I found the reference in the Image Collection at Wetcanvas and because of those enormous eyes, thought it might be fun to try painting this fellow. I began with a wash of the color patterns, moved to the eyes, and finished up with the feathers and the beak. It was definitely the the eyes that captured my attention. Focusing on the eyes of animals is a joy. Another painting of animal eyes emerged when I painted a pair of Cat's Eyes a while ago. The Cat's Eyes painting is for sale at Small Impressions Gallery for $50.00 plus $6.50 for shipping to US addresses. This painting will join the cat when the paint dries. After painting a lot of colorful little paintings of fruit and flowers, I felt a need to get back to reality. Winter in the Pacific Northwest is characterized by fog, rain, and dampness. We get used to the constant drizzle and wet feet. 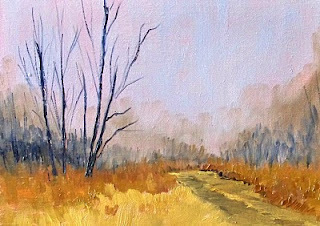 Today's 5x7 inch painting displays the foggy dampness I'm talking about. It was created on a 5x7 inch hardboard panel. I began with a wash of alizarin crimson, added the sky with a mixture of ultramarine blue and titanium white, then began working the distant trees into the sky color with a mixture of ultramarine blue, alizarin, and just a touch of sap green to gray down the purple. 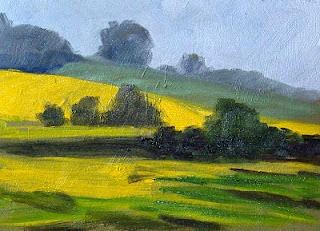 The grasses were painted with raw sienna, yellow ochre, and naples yellow. Lastly I used a script brush to add the trees in the foreground. More of my small landscape paintings can be seen online at Small Impressions Gallery. If you are interested in purchasing one of the paintings on my blog and it does not appear in the Small Impressions Gallery, please send an e-mail to me at smallimpressions@hotmail.com with the date of the entry and I can quote you a price. A few days ago I heard on the local news that we had just travelled through a period of 15 days straight with nothing but gray skies. Since then, it has continued to be gray and damp--no sunshine--going on 20 days now. Perhaps because of this, I've been tempted to paint flowers, something I seldom paint. The bright red and pink of fuchsias tempted my desire for some color. This painting is 5x7 inches on a gessoed hardboard panel. This morning as I was contemplating my next painting adventure, I recalled an art lesson many years ago in which the task of painting negative space was assigned. The task required painting only the negative space from which would eventually emerge the subject of the painting. The sky behind a rather large oak tree was the negative space that begin growing from the bristles of my brush. Then, a distant range of mountains grew in front of the sky. All the while, the subject of my painting, an oak tree, was supposed to be emerging as did the subject from my exercise years ago. Needless to say, as I continued to paint, that which began to appear looked more like a blurry mess than a tree. After much dabbing and mucking around, I finally abandoned my efforts, placed the experiment on the drying rack, and moved on to something a bit more positive. While putting the exercise out of my mind, this trio of lemons wandered forth. My strokes were quick and fluid, feeling a lot better than my exercise in negative space. This painting is 6x6 inches on a canvas panel and felt pretty positive. Thus, is how I concluded my morning in the studio. This little painting can be purchased for $36.00 plus $6.50 for shipping to US addresses by clicking this link and putting it in the shopping cart. It has been a while since a landscape painting has stumbled off my brush. Today's little 5x7 inch painting was a good review of some of the things I don't want to forget about painting landscape. A little trick I've used to create arial perspective is to paint the sky first and then paint the distant tree line right into the sky color. The sky color, a mixture of ultramarine blue and titanium white, acts like the moisure in the air that causes trees in the distance to have a blue cast. Yellow advances and blue receeds. This little painting served as a reminder of simple ideas I don't want to forget. In today's painting I give a nod to my favorite color combination--green and purple. What can I paint using this color combination? Kiwi on a purple plate provide an answer. The painting is 5x7 inches on a small canvas panel. When I take it off the drying rack, it will probably join some of my other still life paintings of fruits and vegetables at Small Impressions Gallery. One of my biggest challenges is photographing dark paintings. I'm in the habit of taking a photo as soon as I've finished. It is like my pronouncement that I shouldn't work on it any longer. The effect is that my paintings are overworked less often; I'm not tempted to go back and make extra dabs here and there. I've ruined too many paintings with continuous dabbing, so I' try to avoid fussing. When the painting is finished I immediately take a photo and call it good. The problem is that dark, wet oil paint is extremely difficult to photograph. The paint grabs every ray of light and reflects it into the camera lens leaving little dapples of white light glinting off the dark surface. I never use a flash; I try to stay avoid taking photos on sunny days and only photograph when the sky is gray and overcast. I can correct some of the speckled surface with a photo editing program, but I'm a purist and prefer not to correct. This little painting is a perfect example of the type of painting that challenges me when it comes to photography. Because the thumbail is small, it isn't as noticeable, but you can see the specks of light in the dark areas if you look closely. This one will probably be photographed several more times before I'm satisfied. In person, it is a lovely little painting, but only when it is photographed well will it be offered for sale online at my Etsy Shop, Small Impressions. 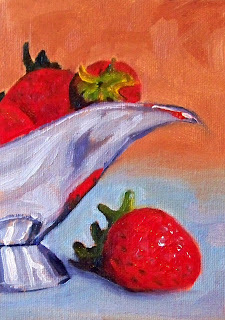 Painting this silver gravy boat filled with strawberries was a fun little challenge. Strawberries are fun just because they are bright, but silver is fun because there is so much reflection in odd, abstract shapes. Together the subject made for a delightful little painting adventure. The painting was created on a 5x7 inch canvas panel. It should be dry in about a week. 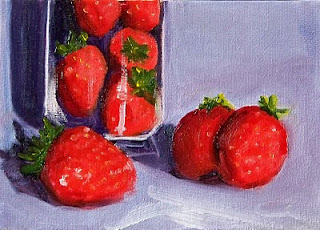 Then I will list it for sale at Small Impressions Gallery at Etsy along with some of my other small still life oil paintings. I've been on a still life painting kick for several weeks, but while cleaning up my studio this morning, I ran across this landscape painting I created a couple of years ago. I've held on to it for a long time because I am fond of the fresh feel of the sky and beach. When viewing it, I imagine sitting on the shoreline watching the waves splash on the beach and smelling the sea air. Even though the feelings it inspires are delightful, I've decided it is time to let it find a new home and make room for some other paintings. It is now for sale at Small Impressions Gallery at Etsy for $125.00 plus $12.00 for shipping to US addresses. It is an 8x10 inch oil painting on a gessoed hardboard panel. The paint is artist quality and in combination with the sturdy surface, it will last a life time. It will fit easily into a standard frame though it is sold unframed. Click here to purchase through Paypal. Today's efforts focused my attention on light and reflection. The subtle oranges and reflected light were the challenge for the day. Alizarin crimson, cadmium orange, cadmium yellow, titanium white, and ultramarine blue made up today's color selection. This painting is on a 5x7 inch canvas panel. 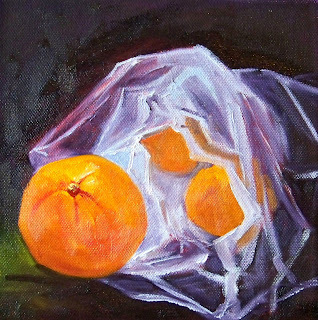 Today's painting was refreshingly easy to paint after yesterday's struggle with painting the plastic bag of oranges. The nice thing about painting glass is that there isn't really much to it. Beginning by painting the contents leaves just the highlights and reflections to paint over the surface of whatever happens to be behind the glass--a few strokes and the glass is finished. 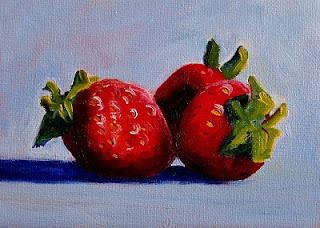 This little 5x7 inch painting is a nice addition to my strawberry series--another 5x7 inch painting and a 4x6 inch strawberry painting which are a fun little group will soon be for sale at my Etsy Gallery, Painting Small Impressions. Keep checking in for new works. I add paintings weekly that range from $20.00 to $125.00. Today's 8x8 inch oil painting on stretched canvas was a big challenge. Trying to create the semi-opaque quality of a plastic bag was definitely tricky. It is much more difficult to create the sense of the plastic bag than it is to paint glass. I will be pondering my approach to this painting and consider other approaches I might take when painting the subject again. Whether it will become an entry in my Small Impressions Gallery collection or not is still undecided. Having fresh oranges year round is a luxury that my grandparents probably didn't enjoy. I'm grateful that in the middle of winter, when the rain is pouring down, the days are short, and the skies are gray, I can still enjoy the sunshine a fresh orange brings to my household. My good fortune helped in making it possible for me to paint this 8x10 inch oil painting. As I painted, I focused on shapes and color rather than the idea that I was painting an orange. The results are abstract and painterly. 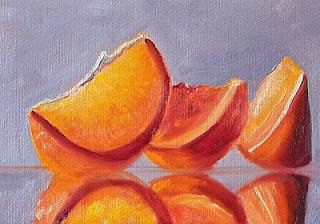 These oranges will be joining my other paintings at Small Impressions Gallery within the next few weeks. Stop by and view my art while the paint on this one dries. When creating this 8x10 inch oil painting, I was attracted by the reflection of light on the black plate. Very little of the plate actually appeared black. The light ranged from gray to blue, and all the way to white. It is the abstraction of light that drew me to this still life. 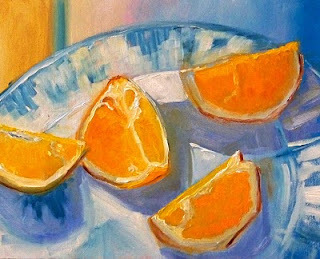 The contrast between the blue of the reflections, the orange of the fruit, and the color of the table top worked well to hold my attention as I painted. You can see more of my small oil paintings if you visit my Etsy Shop . I'm still on a fruit-painting binge. Fruit is forgiving because it isn't perfect. A crooked pear, a lopsided orange, it doesn't matter because nature isn't perfect. Fruits and vegetables allow for errors in drawing thus making it easy to continue my fruit-painting addiction without constant reminders of how inadequate my skills may be. One thing I know for sure is that a lack of skill definitely shows when manufactured items appear in my still life painting. 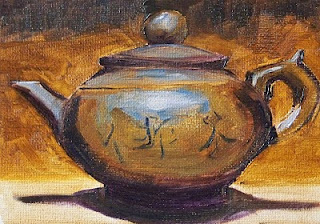 A cup, a bowl, a plate, or a tea pot, mistakes in drawing show. Thus, I took some time out from my little fruit-painting spree and concentrated on a manufactured item which serves to keep me humble. If the porportions aren't accurate, it is obvious. A crooked handle, a lopsided bowl, the errors show immediately. I forced myself to concentrate on accuracy of my drawing before painting this little vessel. Though I'm happy with the way it turned out, it served to keep me humble and focused. While I will probably continue to work on more of my little fruit paintings, I'm making a resolution to work on vessels and paint for accuracy every once in a while. My paintings can be purchased at Small Impressions Gallery. This 5x7 inch oil painting on a canvas panel may eventually join the rest, but for now, it will serve to help me remember that I need to keep working on proportions and do it frequently. My fruit painting binge started with that book, The Botany of Desire, by Michael Pollan. 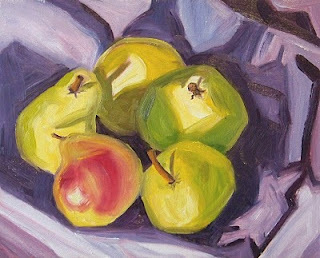 The chapter on the "Desire for Sweetness: The Apple," took me back to the time when I painted a lot of apples. They are good practice. 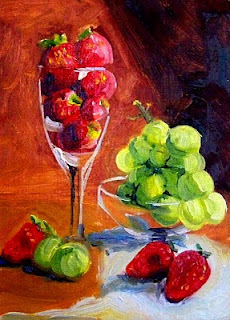 An instructor once told me that if I ever wanted to be good at painting the human figure, I better learn to paint fruit. 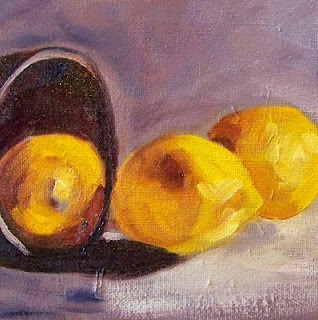 Well, I still don't feel proficient at painting the human figure, but I've sure started to binge on fruit paintings. The color is what attracts me. Fresh fruit and the abstraction of light keeps drawing me back. This little painting is on a canvas panel, is 5x7 inches, and is the continuation of an addiction I can't seem to let go of. 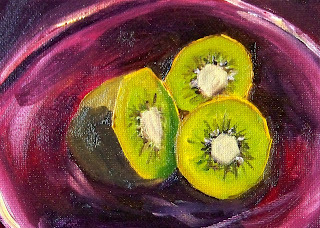 As I continue my binge, I'll keep sharing my little fruit paintings. Some of them will be for sale at Small Impressions. After all, I need to support my addiction somehow. This painting can be purchased here for $35.00 plus $6.50 for shipping to US addresses. It seems I am always waiting for my paintings to dry. I look at the number of blog posts that end with, "When it is dry . . ." It finally made some sense today when I realized that my favorite oil paint, M. Graham, is made with walnut oil instead of the more common lindseed. Oil paint is slow to dry anyway, but apprently walnut oil slows the process even more. Some colors are slower than others. Titanium white takes its time as well as does cadmium yellow. Perhaps that is why it took so long for this painting to finally dry to the touch. Major ingredients included both of those colors plus the fact that the paint was thick and juicy. As a result of my patience and daily checking to see what is dry in my studio and what needs to sit a little longer, I was finally able to pull this one off the drying rack, list it for sale at Small Impressions, and feel good about not having to say, "When it dries . . ." This painting, which was a really fun, loose one to create, can be purchased for $125.00 plus $12.50 shipping to US addresses. It was created on a 1/4 inch hardboard panel and will last a lifetime. Click here to purchase. It is a happy new year! Though I'm not usually a painter of flowers, every once in a while my brush moves in the floral directon. This 5x7 inch painting emerged after I recently finished reading Michael Pollan's book The Botany of Desire. His prose are delightful and his descriptions of colorful tulips in the second chapter on the desire for beauty moved me in a floral direction. It will find its way to Small Impressions Gallery when it is dry.